Question: Why are fighting sports split into weight classes? Answer: Because your weight is the engine of your power. To put it simply, a one hundred kilogram person hits you with one hundred kilos, provided that it’s properly recruited. What is probably most difficult at beginner level is coming to grips with the notion that power isn’t in your arms and legs, it’s actually in your torso and your limbs are conduits of that force. You don’t punch out of your arms; you extend your arms as you rotate your hips. That movement is driven by your legs. THE DRILL: Medicine ball twists. Hold a light medicine ball against your chest, position your feel in a boxing stance (dominant foot back, feet shoulder width apart) and rotate from side to side. Imagine a plumb line descending through the crown of your head and issuing through your pelvis. You need to turn around that axis. If you’re falling all over the place, remember: it’s just like riding on the tram. Bend your knees and drop your weight into your legs. …You’ll soon discover it’s harder than it looks. It feels ridiculous not being able to stay on balance while performing such a seemingly simple activity, although this is the essence of your job. You now have the cornerstone of striking. Match the rhythm of your breathing to the rhythm of your rotation and you are on your way. The thing to remember with striking is that good technique feels awkward precisely because it’s unnatural. 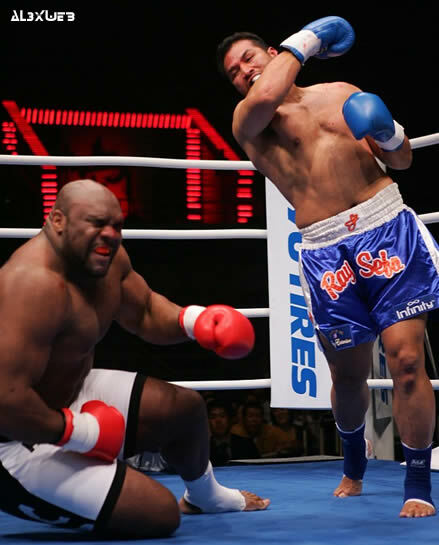 A good way to develop effective technique is to focus on the specific feeling of discomfort that accompanies throwing an effective punch or kick. Practice is the business of refining neural pathways, the exact pathway that the electrical impulse travels from the brain to your extremities – your arms and legs. It sounds silly, but you won’t be able to tell a good strike from a bad one. Short of a testing these things out on a victim, you need to collaborate with a skilled instructor, particularly at beginner level.